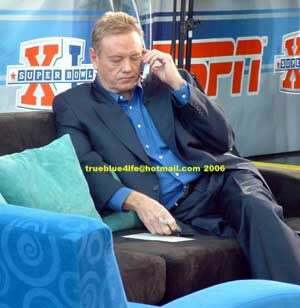 We've certainly made fun of Woody Paige for a while around these parts, but we've still given him a level of esteem and prestige above that of a random late-night talk-radio caller. But considering the amount of basic understanding (or lack thereof) of how the operation of a baseball team works he showed in yesterday's column about the Rockies and Matt Holliday, we have perhaps been too generous. Now that the Rockies have the worst record in baseball — oh, and how did THAT happen, by the way? — Woody writes that the Rockies should trade Matt Holliday and start over. That's reasonable enough; he's not the first person to write that. But, uh ... maybe he should look into some of those trade scenarios. Or, consider: The Rockies acquire Cleveland pitcher C.C. Sabathia, who got off to a terrible start before settling. It would be 2007 Cy Young winner for MVP runner-up. Sabathia will be a free agent at the conclusion of the season. But it would make sense for dollars to the proven 27-year-old left-hander — probably close to $100 million over five years. The Giants? Holliday would be The New Left Fielder, and perhaps the Rockies could pry Tim Lincecum, and others, away from them. As Vegas Watch points out, that first scenario would involve trading your biggest chip for a player who is a free agent at the end of the season. And the second scenario would require the Giants to trade their best, cheapest, youngest pitcher — who's under team control for the last five years — for a guy with a contract that expires soon. We know it's probably rote by now to point out just how lazy and ill-researched so many "mainstream" newspaper columns are. But sometimes, you know, it just makes your jaw drop, no matter how many times you've seen it.